A social media post encouraging customers to drink six beers has been banned by the alcohol marketing watchdog. The Southern Bay Brew Co, based in Geelong, fell foul of Australia’s Responsible Alcohol Marketing Code with the tweeted meme. 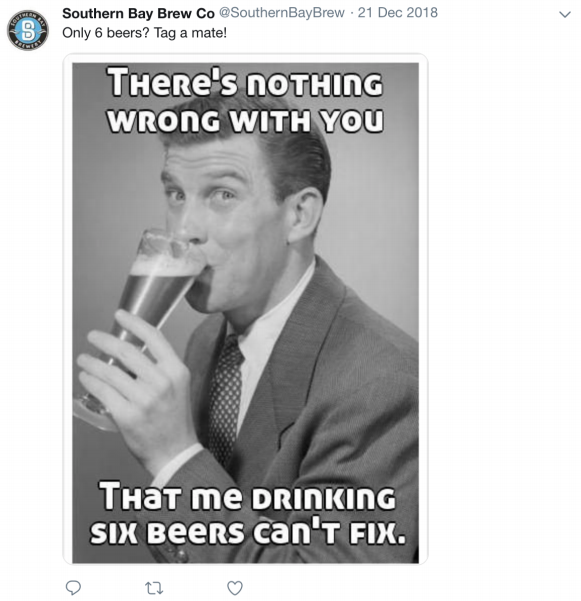 The image showed a 1950s inspired image of a man in a suit drinking a glass of beer with the message “there’s nothing wrong with you that me drinking six beers can’t fix”. Southern Bay Brewery said it outsourced its social media to a “contracted media company based in Tasmania” and that the post was intended to bu=e humrous, rather than offering serious advice on how to handle a difficult person. “We do not believe the post suggested that the consumption of six beers suggested it would change the person’s tolerance of another individual. We believe the post relates to a more relaxed outlook. It certainly would not contribute to any significant change in behaviour,” the company said. However, the ABAC ruled that the tweet implied people should use alcohol to “overcome a deficit” and implied it is acceptable to use excessive alcohol consumption to deal with difficult situations. However, it ruled that the message did not encourage excessive drinking. The ABAC must consider consumers are rather stupid.